To learn more about our club and programs, please select "About ALC" from the vertical menu to the left. Registration for the ALC 2019 Spring Lacrosse season is open! Registration for the ALC 2019 Spring Lacrosse season is open through Sunday, February 3rd. Please sign up now! There will be a $20 late fee on any travel team registration after January 21st. Registration for our D Division (1st/2nd grade) will remain open until spots are filled by the end of March/beginning of April. 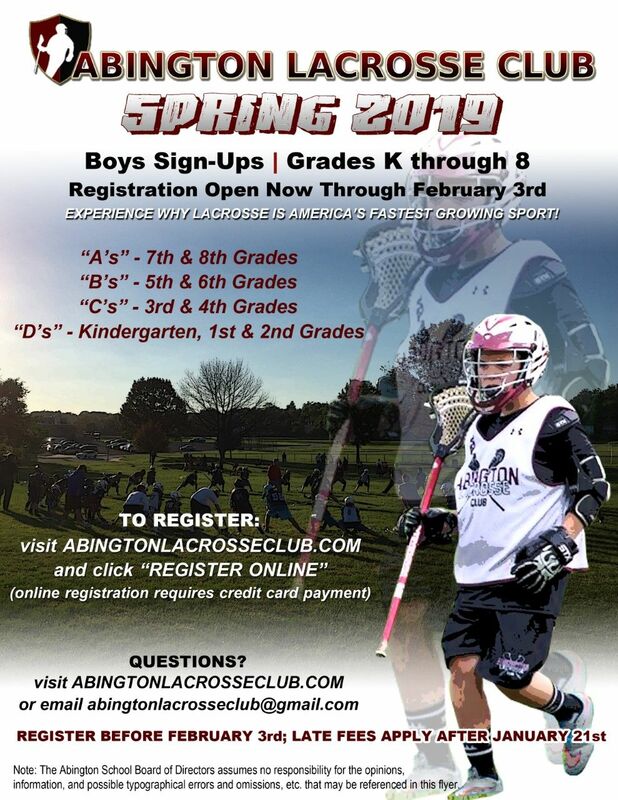 Registration can be accessed at: http://www.abingtonlacrosseclub.com and clicking the Maroon "Register Online" tab in the left hand menu. Information regarding the pre-season indoor sessions and other season details will be emailed to registered players when finalized.